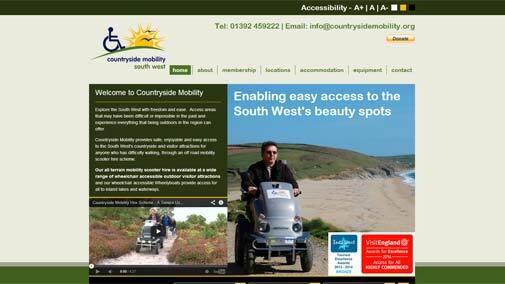 Countryside Mobility South West is a not-for-profit mobility equipment hire scheme working to improve access to the countryside for people with limited mobility living in and visiting the South West region. The scheme was established in 2010 and is operated by the charity Living Options Devon, a user-led organisation working to ensure that people with disabilities and Deaf people are empowered to lead the lives they choose. They work with a variety of partners who hire out Tramper mobility scooters and wheelchair accessible Wheelyboats at their visitor attractions across the south west, to enable people with limited mobility to enjoy and access to the countryside. They undertake safety assessments and Disability Access Audits at each site, aided by two access auditors who have first hand experience of living with a physical disability. The website harnesses the use of greens and whites to portray the the fact that they are a countryside based organisation. Video footage has also been incorporated onto the homepage to make good use of visual content for those visiting. The site is also responsive for use on tablets and phones.